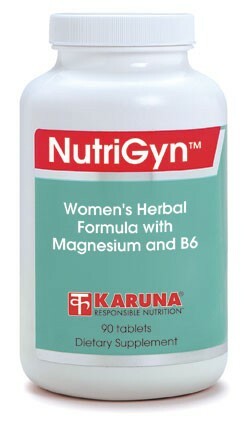 NutriGyn combines specific botanical extracts, freeze-dried glandulars, vitamins and minerals to help maintain a normal premenstrual hormonal balance. Several clinical studies have confirmed the benefits of chaste berry (Vitex agnuscastus) extracts, vitamin B6, and magnesium for promoting normal regulation of mood, fluid balance, breast physiology, and overall comfort during the latter portion of the menstrual cycle. Traditional remedies Dong quai (Angelica sinensis), wild yam (Dioscorea villosa), and three supportive glandulars are included for a comprehensive formula supporting premenstrual health. Double-blind trials have found Vitex effective for maintaining physiological balance in terms of mood regulation, fluid balance, and overall comfort during the latter portion of the menstrual cycle (BMJ 2001;20:134-7; Arch Gynecol Obstet 2000;264:150-3; J Womens Health Gend Based Med 2000;9:315-20). Vitamin B6 has been found to balance physiological function during the latter portion of the menstrual cycle in most clinical studies (J Womens Health Gend Based Med 2000;9:131-9; BMJ 1999;318:1375-81). Magnesium is frequently low in women with premenstrual discomfort (Ann Clin Biochem 1986;23:667-70); supplementation has supported normal mood regulation, fluid balance, and overall comfort (J Am Coll Nutrition 2000;19:3-12; J Womens Health 1998;7:1157-65). Dong quai has a long history of use in Traditional Chinese Medicine as a component of women's herbal formulas (Chin Med J 1991;104: 776-81). Suggested use for adults: One tablet, 2-3 times daily, at least two weeks prior to onset of menses or as directed.